Back in November of 2014, one of the crowd funding items in my Tuesday Tidbits posts that I was promoting was an idea some folks had, for a new bar in Indianapolis. Now, you might be asking yourself, “Doesn’t Indy have enough bars?” but this one was going to be a bit different. 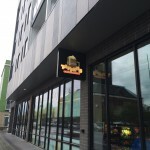 The name was Tappers Arcade Bar, and not only was it going to give us local and regional craft beer, but it was also going to have arcade machines! If you don’t remember, here was their IndieGoGo campaign page, where they were successfully funded. After their successful campaign, they then started the long process that is opening a bar in the city of Indianapolis. 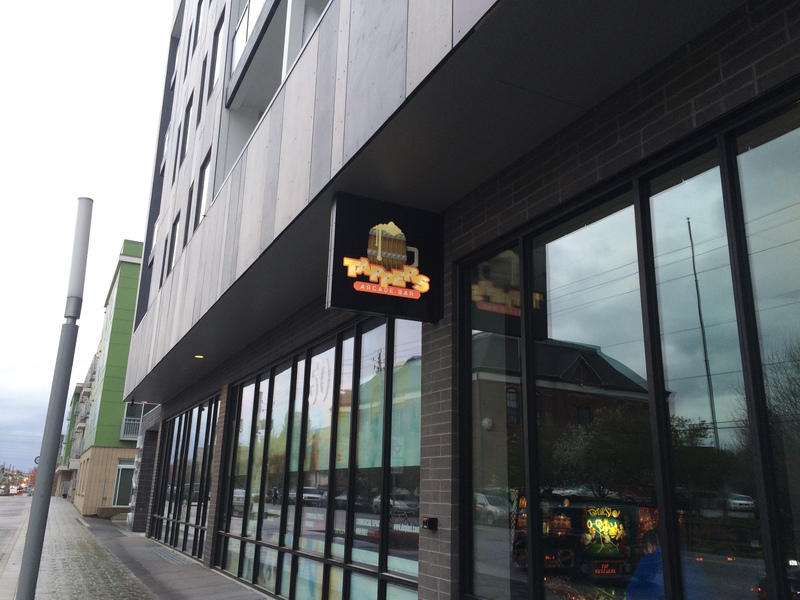 Fast forward to Monday, April 4th, 2016: Tappers Arcade Bar is officially open for business! True to their word, they are a bar that serves local and regional beers from breweries like Black Acre, Fountain Square, Indiana City, Upland, and Bier, as well as wine (they are still working on their liquor license). The wait staff is extremely friendly and helpful, serving everybody at the bar as quickly as possible and also watching the floor for empty glasses. For example, not even less than two minutes after I finished my drink at a Super Mario Brothers machine, I had someone asking if I’d like another drink, and taking care of the empty glass. Considering how busy it was that evening (as you can see from the pictures at the bottom), that is an attentive staff! The current tap list is shown on monitors above the bar, as well as on small clipboards located on the bar and on tables around the the room. However, what really sets this bar apart from the other watering holes in town are the games! Tappers Arcade Bar, as befitting their name, hosts over forty arcade machines, all set free to play. When my brother and I visited, we played Virtua Fighter 2, Mario Bros, vs Super Mario Bros, Frogger, Arkanoid, Paperboy, Wizard of Wor, and of course, Tapper. However, they have so many more! If you spent any time in a video arcade in the 80’s or early 90’s, you’re going to find a favorite here! In addition to the arcade machines, they also have a selection of pinball machines (currently 4), that are set to fifty cents a game, or a buck for three games. So, do remember your quarters when you come to check it out. Oh, and of course, there are small tables beside the machines for you to put your beer while you’re playing, and the pinball machines have cup holders attached! Now, as far as the bar itself is concerned. As I said before, the staff was very friendly and attentive. They have artwork/graffiti on the walls, paying homage to the era their games come from, and the big screen TVs, instead of sports, play something more attuned to their clientele. For example, on our visit, they were playing Who Framed Roger Rabbit, but when I’ve seen other people’s posts and tweets about visiting, I’ve heard of Star Trek being played, so I know they switch it around. One thing that got to me a little bit was how crowded it was. I mean, I’m a veteran of Disney theme parks and the main halls at both Gen Con and San Diego Comic Con, but this was crowded. Of course, it’s a new bar, in the first week, and this isn’t a BAD thing. In fact, despite the fact it was so packed, I noted that everyone was happy and cool about it! I mean, I’m a large man, and I’m trying to navigate around groups of people gathered around a video game, but if I bumped into someone, and apologized, they were completely understanding. It’s like there was an unspoken rule: We’re all in there to have a good time, we know it’s crowded, you be cool with me, and I’ll be cool with you. I really, sincerely hope this is an attitude that continues as the bar continues to grow and thrive. Also, please note: This is a bar. It caters to the over 21 crowd. This is not a family establishment. Your ID will be checked at the door! Since I really don’t normally write about a strict bar, I wanted to make sure that was clear! Tappers Arcade Bar is definitely worth a visit if you’re into nostalgia, fun video games, and good beer. Check them out. In fact, here’s the information you need, along with some pictures I took on a VERY busy Thursday night! When are they open? Monday through Thursday from 4:00 PM to 12:00 AM, Friday from 4:00 PM to 1:00 AM, Saturday from 12:00 PM to 1:00 AM, and Sunday from 12:00 PM to 12:00 AM. Just kidding on the phone number! Internet! Where can I find them online? You can see everything that is going on either on their Facebook Page or their Twitter Page. If it’s your sort of thing, don’t forget to also leave a review on their Yelp Page!